Our 1 King Bed and 1 Double Sofa Bed guest room can comfortably accommodate up to three guests. 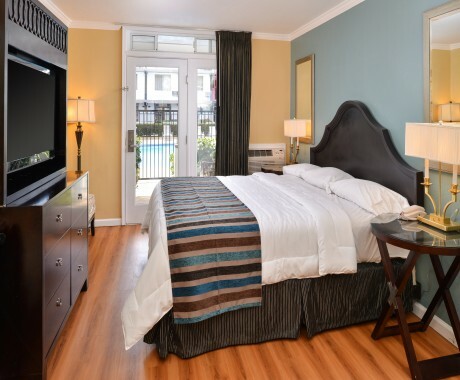 This non-smoking room features beautiful water views from a private balcony and is equipped with complimentary WiFi, a TV with premium cable channels, a refrigerator and microwave, a coffee maker, personal climate control, an iron and ironing board, a safe, and a work desk with a telephone. The private bathroom includes fluffy towels, and a hair dryer and complimentary toiletries. Our accessible 1 Queen Bed and 1 Double Sofa Bed guest room is ideal for guests looking for mobility features and can accommodate up to three guests comfortably. 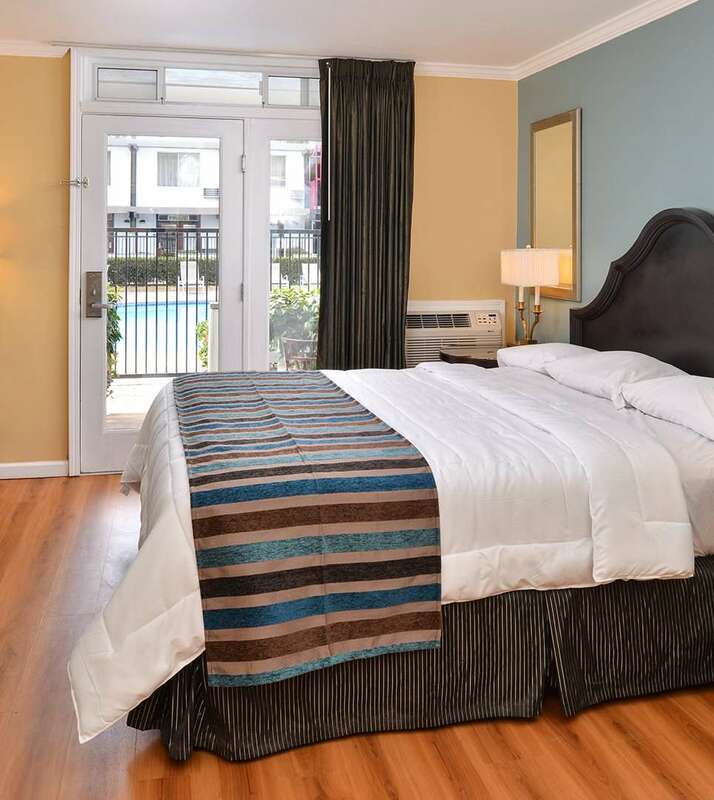 This non-smoking room features wheelchair accessibility, an accessible path of travel around the bed, beautiful water views from a private balcony and is equipped with complimentary WiFi, a TV with premium cable channels, a refrigerator and microwave, a coffee maker, personal climate control, an iron and ironing board, a safe, and a work desk with a telephone. The private bathroom is equipped with stabilizing grab bars and includes fluffy towels, and a hair dryer and complimentary toiletries. Our superior one King Bed, marina view guest room can comfortably accommodate up to two guests. This non-smoking room features Marina views and is equipped with complimentary WiFi, a TV with premium cable channels, a refrigerator and microwave, a coffee maker, personal climate control, an iron and ironing board, a safe, and a work desk with a telephone. The private bathroom includes fluffy towels, and a hair dryer and complimentary toiletries. 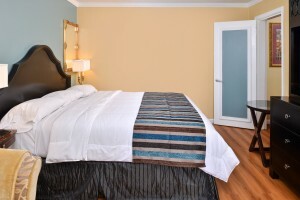 Our one King Bed non-smoking guest room can comfortably accommodate up to two guests. This room is equipped with complimentary WiFi, a TV with premium cable channels, a refrigerator and microwave, a coffee maker, personal climate control, an iron and ironing board, a safe, and a work desk with a telephone. The private bathroom includes fluffy towels, and a hair dryer and complimentary toiletries. Our standard one King Bed guest room can comfortably accommodate up to two guests. This non-smoking room is equipped with complimentary WiFi, a TV with premium cable channels, a refrigerator and microwave, a coffee maker, personal climate control, an iron and ironing board, a safe, and a work desk with a telephone. The private bathroom includes fluffy towels, and a hair dryer and complimentary toiletries. 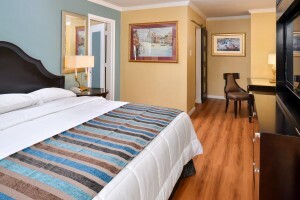 Our superior one King Bed guest room can comfortably accommodate up to two guests. This non-smoking room is equipped with complimentary WiFi, a TV with premium cable channels, a refrigerator and microwave, a coffee maker, personal climate control, an iron and ironing board, a safe, and a work desk with a telephone. The private bathroom includes fluffy towels, and a hair dryer and complimentary toiletries. Our executive suite includes a king bed and a double sleeper sofa to accommodate up to three guests comfortably. This spacious non-smoking suite is equipped with complimentary WiFi, a TV with premium cable channels, a refrigerator and microwave, a coffee maker, personal climate control, an iron and ironing board, a safe, and a work desk with a telephone. The private bathroom includes soft towels, and a hair dryer and complimentary toiletries. 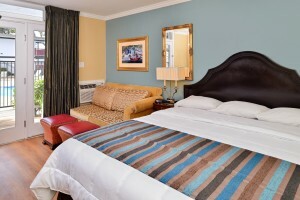 Our superior two queen beds guest room can comfortably accommodate up to four guests. This non-smoking room is equipped with complimentary WiFi, a TV with premium cable channels, a refrigerator and microwave, a coffee maker, personal climate control, an iron and ironing board, a safe, and a work desk with a telephone. The private bathroom includes fluffy towels, and a hair dryer and complimentary toiletries.